A renowned fuel company in Exeter, ON | Dave Moore Fuels Ltd.
Dave Moore Fuels Ltd. has been in business since 1976. We are a family-owned company that offers high-quality Petro-Canada products to clients in Exeter, ON and the surrounding communities. Our service area includes Goderich, Mitchell, Dublin, Lucan Biddulph, Grand Bend, Parkhill, Thedford, and all areas in between. We pride ourselves on providing all of our clients with industry-leading customer support, supplying fuel and lubricants to the agricultural, residential, and industrial sectors. In addition, we have a 24/7 cardlock facility in our Exeter and Mitchell locations. If you are looking for a place to fill up your gas-powered vehicle, you’ve come to the right place. Visit our station today for top-notch gasoline! We can also deliver the fuel to your location. We carry heating oil for house furnaces. Although this fuel can be used for commercial purposes, it’s mainly used for rural homes. For your benefit, we source our heating oil from Today’s Brand. We have clear diesel, which is used for road vehicles such as transport trucks. Additionally, we offer dyed diesel, a variant used for off-road trucks such as tractors and construction equipment. We provide propane for residential use, mainly for rural farms. 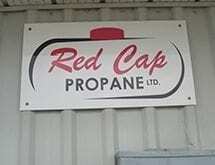 To ensure your safety, we only carry propane supplies from Red Cap, which is one of the most dependable names in the gas industry. Forget about waiting for days to get your supply of diesel or gasoline. At Dave Moore, we are the most dependable name in ON when it comes to fuel deliveries. As long as you’re located within our areas of operation, we guarantee that you’ll get your fuel on the same day that you ordered it. We understand how inconvenient it can be when you run out of fuel. Don’t worry! With our round-the-clock emergency support, you can get gas on short notice. Simply call us if you need our assistance. No matter the time or date, we’re more than happy to be at your service. One of our goals is to make our goods available to many clients. This is why we have 2 locations in Exeter and Mitchell. Regardless which branch you choose, we assure you that you’ll receive the same superb products and services that our patrons have come to know and trust. We have a simple-to-use online application method. Our credit program is suitable for either company or personal use. We provide credit with reasonable interest rates. Monday to Friday: 5:00 a.m. – 5:30 p.m.
© , Dave Moore Fuels Ltd.. All Rights Reserved.